Pangrams, or holoalphabetic sentences, are sentences that contain all letters of the alphabet. 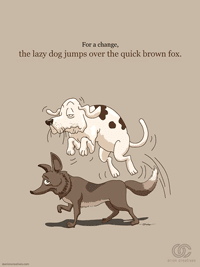 Perhaps the most common example is "The quick brown fox jumped over the lazy dog." Pangrams can be particularly useful in keyboarding instruction and quick assessment. With just one sentence, students demonstrate their ability to navigate the full keyboard including the Shift key and punctuation. What else can you do with pangrams? With younger students, identify each letter in the sentence, look for vowels, consonants, blends, etc.. Count how many times letters appear (a perfect pangram will only have 26 characters, each letter appearing only once). As a small writing activity, challenge students to write their own pangram. Increase the challenge and specify a theme, writing style, or limit the number of words or character. In the real world, pangrams are often used to demonstrate a font, typeface, or handwriting. Invite your students to develop a pangram that speaks to the feeling of a chosen font.